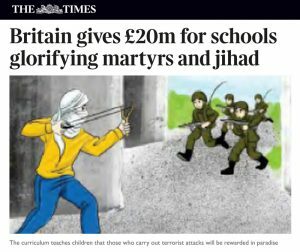 The British government last year gave £20 million to Palestinian schools teaching a curriculum that a watchdog group says embraces jihad, omits references to peace agreements with Israel, and encourages martyrdom, the Sunday Times reported. Among the ideas taught to pupils are the physics behind slingshots used to hurl rocks at Israel soldiers, the glorification of martyrs, and images that infuse ideas of war. First, the time will come when Israel will lose territory to the Palestinians (for scriptures, check out the following: Gaza and the Palestinians in Bible Prophecy). Since the above prophecy involves Ephraim (a reference to the British-descended peoples, watch: British are the Covenant People ) and Samaria (see: Spiritual Samaritans: Old and New), this is indicative that the UK and USA will be attacked (see also: Anglo – America in Prophecy & the Lost Tribes of Israel), apparently including terroristic tactics (hitting them before and behind)–though not all Syrians or Palestinians would be part of this. The UK’s apparent funding of education to encourage violence among Palestinians is disturbing and will not result in Palestinians loving the British. Of course, right now, because of his statements about Jerusalem being Israel’s capital, plus the move of the US embassy to Jerusalem, US President Trump is considered to be a major problem by the Palestinians. Understand that the current Anglo-American world order is on its way out and the final time of the Gentiles is coming (Luke 21:24; Revelation 11:1-2; see also The Times of the Gentiles). The Bible shows that the time will come when the USA (Daniel 11:39) and its Anglo-Saxon descended allies will be conquered (Daniel 8:24-25; Jeremiah 30:7). And while upsetting the Palestinians will not be the primary cause, upsetting major parts of the Arab world and Europe will be (cf. Psalm 83:3-8). The UK, USA, Canada, and others will be hit with more terrorism. This entry was posted on Monday, April 9th, 2018 at 2:30 pm	and is filed under Prophecy.